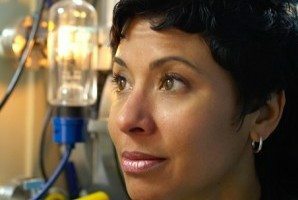 Detroit Xconomist Ann Marie Sastry, founder and CEO of the advanced battery startup Sakti3, has announced that she is stepping down from her post at the University of Michigan, where she has served as the Arthur F. Thurnau Professor of Mechanical Engineering, Biomedical Engineering, and Materials Science and Engineering. Sastry will be honored at a reception on June 15 hosted by the university and Michigan’s Congressional delegation. We caught up with Sastry, who was on her way to Xconomy’s Napa Summit, to ask her some questions via e-mail. She says she was honored to be a part of U-M, which she describes as a “great research institution,” and is proud of her contributions to the university, which include her work with the Energy Systems Engineering Program and the Academic Lives Initiative, as well as mentoring students to the point that they are now successful professionals. Sastry also says she looks forward to continuing the positive relationship between U-M and Sakti3, which was spun out of technology developed at the university. Sastry is stepping down to focus the entirety of her professional attention on building Sakti3 into a “great company” that creates technology to improve people’s lives. “We are scaling up operations, and although there is no one moment in a company’s development that is the sole critical point, this one is very important,” she says. She gave a special shout-out to her colleagues at U-M who will take over some of her duties and maintain the programs she started. “The sustainability of these efforts is not only due to planning on the part of all of the collaborators, which has been going on for over two years, but also due to to the quality of the faculty that are running them, particularly Professor Wei Lu, Professor Margaret Wooldridge, and of course Professor Christian Lastoskie,” Sastry adds. What does she think of A123’s bankruptcy?